It includes an SLX4 Diversity Receiver, and an SLX2/SM58 Wireless Handheld Microphone. The SM58 is the legendary choice of vocal performers around the globe. 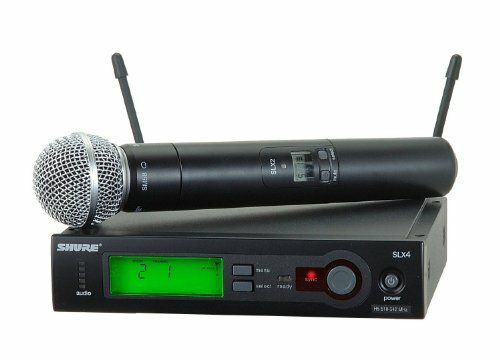 This Shure SLX Wireless Microphone System includes an SLX4 Diversity Receiver, and an SLX2/SM58 Wireless Handheld Microphone. Shure offers wireless freedom combined with the legendary microphone that is the choice of vocal performers around the globe. Sound installations and working bands need powerful wireless tools that can be set up quickly and used confidently. Shure's rugged SLX Wireless Systems exceed these demands with innovative automatic setup features, such as auto frequency scan and transmitter setup, and exceptional wireless clarity. Supporting 20 compatible systems across multiple UHF frequency bands, SLX smoothly integrates into houses of worship, lecture halls, conference rooms, and mobile gear cases. SLX Wireless Systems feature Shure's patented Audio Reference Companding for crystal-clear sound beyond the limits of conventional wireless. SLX4 Wireless Receiver The Shure SLX4 wireless receiver is a breeze to use with Automatic Frequency Selection and Automatic Transmitter Setup. With included rack hardware and detachable antennas, it is ready for immediate installation right out of the box. SLX2/SM58 Wireless Microphone The Shure Wireless Handheld Microphone consists of the SLX wireless handheld transmitter fitted with the SM58 cardioid microphone capsule. The Shure SLX2 Wireless Handheld Transmitter includes timed backlit LCD display, frequency and power lockout, and "Mute" functionality. The SLX2 transmitter design allows for interchangeable microphone cartridges. The Shure SM58 vocal microphone is tuned to accentuate the warmth and clarity of lead and back-up vocals. It is consistently the first choice of performers everywhere.